Supernatural splits Sam and Dean up on separate hunts with different partners to flesh out the alternate Charlie and add new layers to Jack. As good as it is to watch Sam and Dean on a hunt together it’s also good to explore how they interact with different characters. 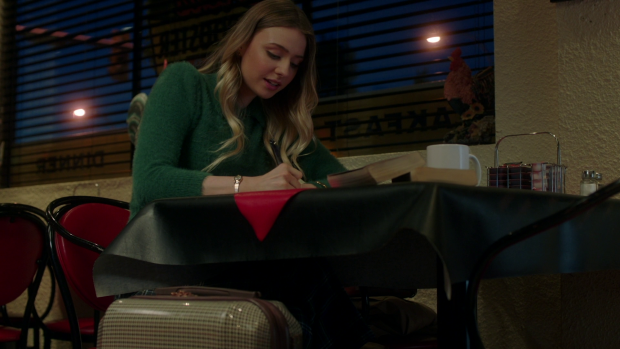 Sam and Charlie make for an engaging pairing in this episode because of the effort put into highlighting how different this Charlie is from the one Sam and Dean knew. This version of Charlie is a very solitary person because she lost the love of her life in the early days of the Apocalypse on her Earth. She talks about Michael setting off an EMP that basically removed the creature comforts that people rely on and turned everyone into animals scrambling for survival. Charlie makes the point that if people are desperate enough they will do whatever it takes to survive even if that means killing others. She has experienced the end of civilisation and seen what that does to people who feel like they have nothing else except a battle for survival. Charlie lost the love of her life to desperate people driven to do whatever it takes to ensure their survival and that loss shaped the person she is now. Her cynical attitude about the world and the people in it makes a lot of sense given what she has experienced. Living through the Apocalypse and dealing with the aftermath of it after she lost Kara meant that she never truly got to deal with that loss and make an attempt to get on with her life because of the constant fear of death. Living in a safer world where she now has options lets her focus on herself and what she wants to do. Charlie tells Sam that this Hunt will be her last one. She resolved to stick around while everyone settled into their new surroundings. As far as she’s concerned that has now happened so she plans to go away and live by herself away from the monsters and death that have plagued so much of her life. Sam tries to dissuade her from leaving because he doesn’t think it’s the right thing for her to do. He tries to convince her that human beings are social animals that need other people in order to have a happy and healthy life. The word “animals” is what causes Charlie to share her experience of seeing people actually behave like animals providing ample justification for her wanting to have nothing do with them. Despite that, Sam is adamant that Charlie is making the wrong decision. I have to say that I was surprised at Sam’s attitude in this instance. It’s somewhat justified in that he has tried walking away from Hunting on a few occasions and has failed but it’s difficult to accept that he would actively discourage someone to do the same. As much as he can’t seem to turn his back on being a Hunter that doesn’t mean that others will have the same experience and the fact that he tries to discourage Charlie from trying to have a life free from the negative trappings that he understands better than pretty much anyone feels out of character for Sam. It could be argued that he’s projecting his feelings about the Charlie he knew onto this one but he is repeatedly reminded that she isn’t the person he knew so I feel that he should have realised that at some point. Charlie’s arc in this episode is something of a disappointing one as it’s about her coming to the realisation that she can’t turn her back on Hunting. The fly monster they are Hunting represents Charlie craving isolation and how that could bring her to a bad end. It’s a solitary creature picking people off to sustain itself and ends up being killed because it isn’t with the rest of its kind relying on them to help it survive. Sam makes that direct comparison to Charlie who could end up suffering if she tries to live a solitary life. Amusingly Charlie doesn’t entirely subscribe to that comparison but takes the point and decides to stick around. Her reaction could be a commentary on the writers knowing that it was a stretch as far as metaphors go. I find this to be too simplistic as the implication is that Charlie only has two options but the whole point of her being in a world that hasn’t been destroyed is that she could do pretty much whatever she wants. Perhaps a more appropriate lesson would be that Hunting isn’t the life for her but maybe there’s something out there that she can focus on that involves forging meaningful connections with people. She could go looking for this world’s Kara to see if there’s a spark between them for example or at least be open to the idea of meeting someone else. 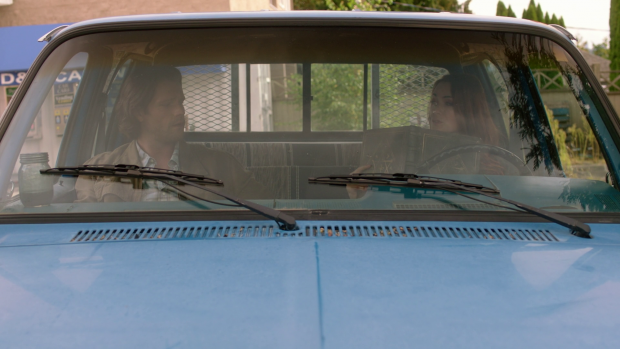 Sam should have been more understanding of how Charlie was feeling and encouraged her decision rather than arguing for her to stay a dangerous life where losing people she decides to become close to is inevitable. Charlie and Sam make for an engaging team. As I mentioned above this Charlie is very different to the other version of the character and this episode spends some time exploring that while taking into account the similarities at the same time. Both Charlie’s are similar in that they were both programmers with a love of technology so it seems that they diverged as people at the point of the Apocalypse. As I’ve said this Charlie is a lot more cynical because she has been hardened by years of losing people she cares about and fighting for her survival. Now that she’s relatively safe her mind is open to different possibilities. Hunting is a new experience for her as well as she was in a constant battle for survival her own world so the methodical approach to research and investigation was largely unknown to her. It’s something she definitely seems to enjoy based on Felicia Day’s performance showing clear fascination in breaking a case down and getting to the bottom of it. There’s certainly more for this Charlie to bring to the show and I’m hopeful that she will start to find some balance in her life. Dean and Jack have always had a fun dynamic so it’s good to have an episode that makes use of that. It makes a lot of sense for Dean to be the one to take Jack on a Hunt because he has always had s more gung ho approach. I would expect Sam to still be building up to taking Jack out in the field without his powers but Dean firmly believes that he will learn better by doing. It takes some convincing but Dean eventually sees no issue with taking Jack on a supervised Hunting trip. The case involves the death of a man in a small town under mysterious circumstances so the usual investigative steps are taken such as talking to those that knew the victim and general looking around. Of course there’s a visit to a diner to sample the local cuisine as well in order to give Jack the full experience. This part is familiar ground for Jack as he has been on a Hunt before though never without his powers. Jack gets more involved in the Hunt by taking an active role in the investigation. He’s played as naive in terms of how people interact with each other as shown by his lack of understanding of what courting is. This makes for an obvious yet effective contrast to Dean who finds talking to women easy. Jack’s naivety juxtaposes against Dean’s experience works really well and creates some humorous scenarios. 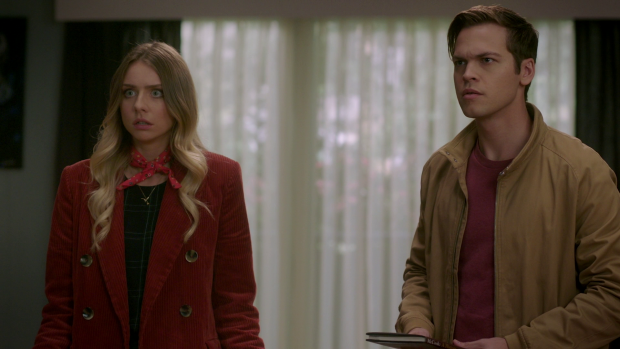 Amusingly it seems to be Jack’s innocence that helps progress the case when he shows Dean up in front of the -apparently- shy and idealistic library worker, Harper (Maddie Phillips). It all seems to be going well at first for Jack who is clearly very taken with her. He isn’t completely blinded to the possibility that she is the killer do does all the tests to see if she’s a Demon, Zombie or any of the other standard monsters that plague Hunters. She passes all of those tests so Jack thinks he’s in the clear and opens up to the possibility that Harper is genuinely interested in him. The scenes between them are really endearing to watch despite how strange they are considering how forward Harper is about love at first sight. Jack takes it at face value because he doesn’t know any better and thinks he has somehow charmed her. Dean hasn’t had the promised “talk” with her yet so he has no idea what the warning signs are. It comes as no surprise when it turns out that she is behind the killings after killing her boyfriend to prevent him from moving away from town. They have a shared fetish about the jealous boyfriend going after men who happen to be interested in her. The entire relationship is founded on Harper’s fantasy of staying exactly where she is and having nothing in her life change with the only excitement or imagination coming from what she reads in books. Jack is able to use her optimistic viewpoint against her by echoing her apparent belief in love at first sight and offer her a relationship with someone living filled with the unconditional devotion she needs. Her love of romance novels ended up being her downfall and the scene itself was really funny in its execution. This will likely serve as a harsh lesson in trust for Jack as he took Harper at face value after testing her and ended up being badly mistaken. Harper’s escape has some potential. I like the idea of Jack being her new obsession and would like to see her return fuelled by her desire to turn him into her next Zombie boyfriend. She’s delightfully unhinged and Maddie Phillips’ performance makes her really likeable in how casually morally bankrupt she is. I can’t see her being a serious threat but as a confusing influence on Jack’s young mind there is definitely fun to be had. A strong episode that make good use of splitting up Sam and Dean. The Sam and Charlie plot worked well because of the focus on showing how different the alternate Charlie was to the version Sam knew. Her life experience has driven her to be very solitary in the way she conducts herself. Losing the love of her life and seeing people turning into animals scrambling for survival put her off the idea of being part of a group. Her desire to get away from the negative aspects of Hunting makes a lot of sense though it is surprising to see Sam try to talk her into staying in this life. He is projecting his feelings about the other Charlie onto her and recounting his own experience on trying to resume a normal life so his point of view makes sense to some degree but actively discouraging her like this feels out of character for Sam who should be more understanding in this instance after all he’s been through. 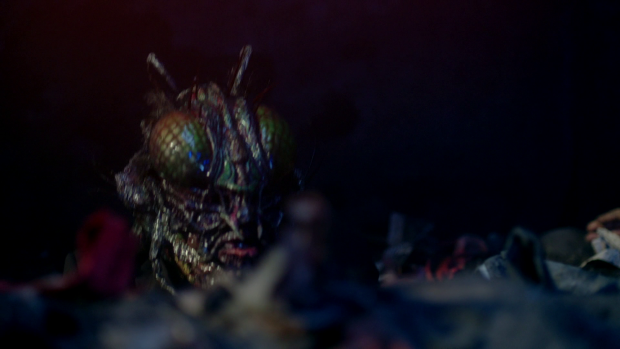 Using the fly monster as a metaphor for Charlie being more vulnerable on her own sort of works if you squint but Charlie would rather not be compared to it which does suggest the writers knew it was a stretch. Dean and Jack’s Hunting trip was a lot of fun as well. Jack’s naivety when it came to dealing with women was an obvious yet effective contrast to Dean’s more worldly ways and his interactions with Harper were really endearing. 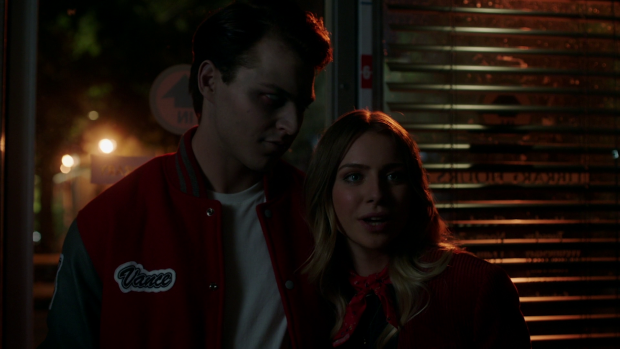 Jack shows himself not to be completely naive as he tests her for all of the monstrous trappings but he still has his heart sort of broken when he thinks that she’s genuine and takes her at face value only to learn that she’s up to no good. Harper’s a really fun character with her fetish for having her Zombie boyfriend protect her from men who are interested in her and the fact she lives in a secluded fantasy world where the only imagination in her life comes from books. Jack exploiting that is a great pay-off to that idea and I like the idea that she will return to menace him once again.